Aloo bonda (Potato / Urulakizhangu masala bondas) are very common and yummy evening snack in India. This snack can be easily prepared at home by following these step wise instructions. Don’t forget to share your outcome or different variants of this recipe you tried with us. In a Kadai / Pan, heat the oil. When it become hot, add sliced onion, chopped green chillies, ginger garlic paste, chopped curry leaves and coriander leaves, salt and fry till it changes its color to brown. Add all the chopped vegetables (Chopped carrots, mashed beetroots and potatoes) and turmeric powder. Mix it well. Add garam masala and chilly powder and mix this well. Cook for another 2-3 minutes and turn of the flame. Transfer it to a large bowl and when it cools mix the whole masala well with your hand. In a vessel, heat 1 cup of water with salt and when it boils add 1tsp oil and 2 cups of all purpose flour and mix it in low flame. Allow it to cool and make it into a dough similar to that of chappathi. Roll out small portions of the dough into lime sized balls. Using a pathiri press / chappathi press / chapathi roller flatten each balls into thin breads. You can apply some oil to both sides of the press to prevent sticking. Spread the masala in the top center of each maida bread and fold from the edges to cover it. In another pan, heat some oil (for frying). When the oil becomes hot dip the maida coated masala balls into the hot oil carefully and fry it till it becomes golden brown. Drain them into a kitchen tissue. Serve aloo bondas / Urulakizhangu Masala bondas hot with Ketchup or chutney. Need more potato recipes? Dont worry, try these. 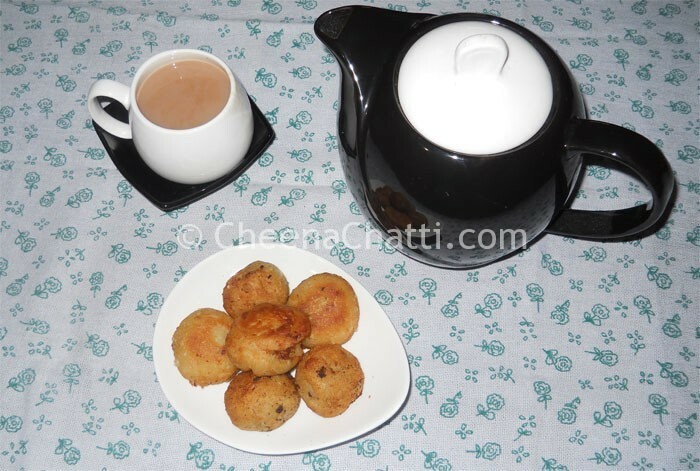 This entry was added on July 19th, 2013 by Renoos in Bakery and tagged with best masala bonda, tasty masala bonda, easy masala bonda, evening snack, best aloo bonda recipe, aloo bonda recipe, masala bonda recipes, easy aloo bonda, crispy aloo bonda. Last revised on April 4th, 2018.